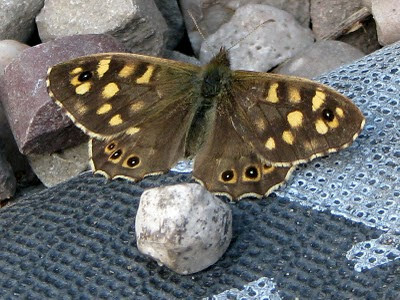 This butterfly is normally seen in more sheltered places than our back garden. It is often the only species seen in dappled shade, or in overcast conditions. When a male encounters a friendly female, (who has a more laboured flight than the male) she will fall to the ground or a nearby leaf where, after a brief kiss and a cuddle, the pair mate. Both sexes feed from honeydew, but also take nectar from a variety of plants when honeydew is scarce. We are seeing many more butterflies since the field at the back of our house was left to go wild. I love butterflies almost as much as flowers. I am glad to read that you are seeing more of them. Tom: So very cool, what a neat butterfly. I've Jane to thank for the picture. My, this is a super shot. Its a photo that stands out by a mile that such a professional has taken this, well done Jane. You have also done a super job in training Tom how to take wonderful shots too.lol.